Why Study Geology at Maryland? Over the past several years Geology undergraduate enrollment has been ~40 majors. With ~20 faculty, this permits consistent excellent faculty-student interaction by maintaining small class sizes. Beyond the 100-level, Geology major classes typically contain under 10 students. Close connection between faculty and students allows for enhanced, individualized networking between future graduates and prospective employers for all students. Studies in Geology require a component of outdoor activity, unlike many majors in the physical sciences. The majority of Geology major courses involve either field-related projects or field trips to regional areas of interest. A number of special courses exist which allow students to explore areas such as the Galapagos Islands or the tropical north Atlantic (a field oceanography research cruise). The major also requires students to complete a 5-6 week Summer field course (GEOL 490). Students are frequently invited along with faculty on field research ventures, where they serve as field assistants in locations such as northwestern France, the Sierra Nevada of California, western Maine and Brazil. 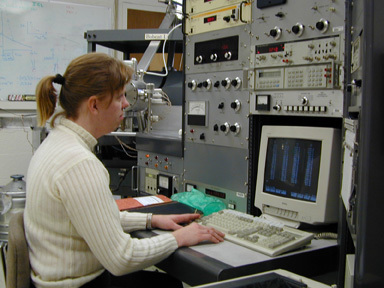 Many students also have significant field components to their Senior Research Thesis. 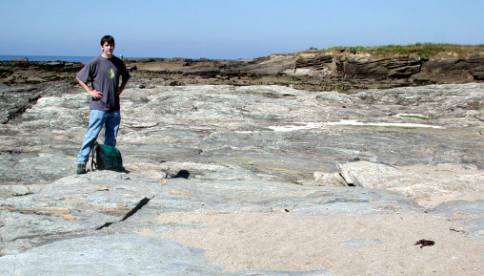 As a Junior, Brendan Puls spent a Summer in Brittany, along France's Atlantic coast, making field measurements of rocks with Dr. Michael Brown. The Maryland Geology Department offers undergraduate students unprecedented opportunities for research. Maryland's faculty, although small, is dynamic in terms of internationally-recognized research, with most faculty members funded by a variety of federal and state agencies. Faculty look to students for assistance at all levels of research work, so prospects for employment in the Department are great over an array of tasks, and students have the chance to work in state-of-the art facilities. Additionally, Geology is unique in our College for requiring all senior undergraduates to complete a year-long research thesis on a topic determined by each student and their chosen faculty advisor. Many of these projects lead to published works in scientific journals and presentations at international conferences. Why is research important? Research gives students experience that classes are less capable of imparting: formulating scientific questions, thinking critically, testing hypotheses. The Geology Senior Thesis program further requires additional preparation in scientific writing and communication, invaluable skills in the workplace. This ensemble of experiences delivers skills that are central to success in careers not only in research, but also in industry, teaching, and policymaking. Amy Gelinas analyzes osmium isotopes in rocks from the Chicxulub impact crater, Mexico, for her Senior Research Thesis, under the direction of Dr. Richard Walker. Outlook for employment in the Earth and Environmental sciences is at its all-time best. Geology jobs are more than just exploration for oil and mining: understanding geology underpins diverse efforts in urban planning, environmental restoration, and defense intelligence, so graduates from a strong Geology program can expect employment opportunities in a wide assortment of industries. The B.S. in Geology or Earth Surface Processes allows most Maryland graduates to work in geology, rather than in slightly-related fields, as is the case with many other science graduates. Most recent graduates are employed in industry, as teachers, or by top graduate schools (e.g., CalTech, Brown, Arizona). Opportunities exist within UMD for students interested in secondary education to follow an accelerated path to Maryland teacher certification, a track made more attractive by the pressing national shortage of science educators. Employers cite the high-level research that all UMD graduates undertake as a key component to their successes in industry. Employers know that Maryland graduates have solid grasp of both geological principles and fundamental science and mathematics, since all students must satisfy requirements in calculus, physics, and chemistry as presented in notoriously demanding courses by nationally-respected departments. The focus in the Geology Department is to give students the intellectual tools with which to excel in whatever endeavor they choose. Thus, rather than emphasizing discipline-specific trivia, we seek to pass on transferable skills: quantitative reasoning, independent analysis, and practical application of theory.